While older orchid society members will regard the following as ‘old hat’, conversations with new members and visitors to our shows have taught me that many don’t appreciate the difference between orchid species and hybrids, nor how the latter arise. 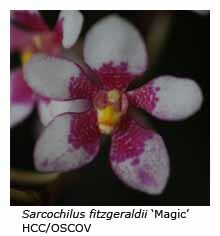 The simplest definition of an orchid species is one that occurs in nature, that is, one that grows in the wild. Species orchids may occur as epiphytes (growing in trees), as lithophytes (growing on rocks) or as terrestrials (growing in the ground). 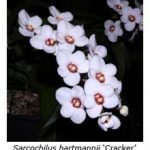 With the exception of a few ‘natural’ hybrids*, all orchid hybrids are made by man – in the first instance by ‘crossing’ (breeding or mating) one species with another compatible (but different) species. This is done by taking the pollen from the flower of the first species, and transferring it the stigma of a flower on the second species. 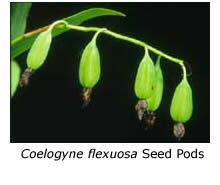 Alternatively, one could transfer the pollen from the second species to the stigma of the first. 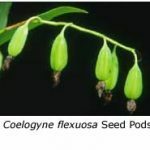 The parent contributing the pollen is known as the pollen parent, while the other partner is often referred to as the pod parent, because eventually, if all goes well, the ovary beneath the pollinated flower will swell to produce a seed pod (or more correctly, a seed capsule). 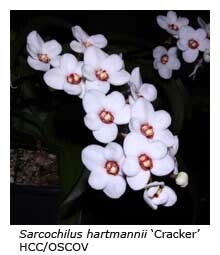 As an example, we can cite the hybrid Sarcochilus hartmannii x Sarcochilus fltzgeraldii, often written Sarcochilus (hartmannii x fltzgeraldii). By convention, the first-named parent is the pod parent, and the second-named is the pollen parent. After seedlings were raised from the seed, and the first flowers appeared, the hybrid was named Sarcochilus Fitzhart by the hybridist (Butler) in 1963. The grex name in this case was derived from a combination of the names of the parent species. The ‘reverse cross’ Sarcochilus (fltzgeraldii x hartmannii), in which Sarcochilus fltzgeraldii is used as the pod parent, is also (by convention) called Sarcochilus Fitzhart. 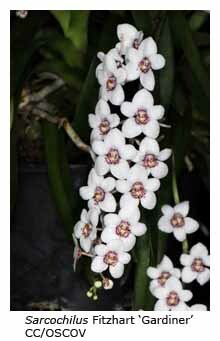 The first term (the genus) is always typed in italics, regardless of whether an orchid is a species or a hybrid. The second part of the species name is also italicised, and begins with a small letter. However, the second part of a hybrid name is not italicised and begins with a capital letter. 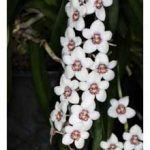 This convention ensures that we can differentiate the names of species orchids from those of hybrids simply by the manner in which they are typed. The above is an example of a primary hybrid, in which each of the parents is a species. More complex hybrids may be created by crossing a species with a hybrid (e.g. Sarco. hartmanni x Sarco. Fitzhart, which gives Sarco. Heidi) or by crossing two different hybrids (e.g. Sarco. Fitzhart x Sarco. Heidi, which gives Sarco. Sweetheart). 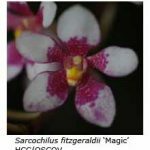 You may have noticed that in this paragraph I’ve abbreviated Sarcochilus to Sarco., which is the official abbreviation for the genus (not Sarc). Sometimes selected forms (cultivars) of a particular species are ‘crossed’ in the hope of creating superior forms of the species. An example in my collection is Sarco. hartmannii ‘Nesnah’ x Sarco. hartmannii ‘Snowball’). Although the two parents have been ‘crossed’, the resultant progeny are NOT hybrids, simply new cultivars of Sarcochilus hartmannii. * Occasionally, natural hybrids are found in the wild. They are formed as the result of pollen being transferred (usually by insects or birds) from one species to another (different) species. They occur rarely because many species have a specific pollinator that does not visit the flowers of other species, while some species have intrinsic chemical barriers to the acceptance of pollen from a different species.